The Cloudwith.me ICO introduces the Cloudwith.me platform which offers a complete platform for cloud based storage and applications. There have been products introduced on the blockchain that address the needs of cloud storage and the ability to run applications on the cloud, but no project addresses the need for one place to go for a complete solution. To decentralize the provisioning of cloud services, migrating from a global infrastructure operated by a small group of hyper-scale service providers to a blockchain-based peer-to-peer infrastructure operated by millions of small individual providers and contributors of cloud resources. To simplify the use of professional cloud services for all levels of web users turning such services into a commodity product universally accessible and utilized by the general public. To monetize the new decentralized cloud services ecosystem with a dedicated cryptocurrency governed by a smart contract enabling automated and trusted reconciliation of payments between all peer-to-peer cloud services providers. The next step in the vision of Cloudwith.me is to bring their current product to a fully decentralized blockchain based platform which would allow for the scale of the services by the participation of millions of cloud service providers. Cloud service providers can be anyone who has extra capacity for computing or storage available, allowing them to become part of the blockchain grid. The providers can then earn profits from their participation using resources they don’t utilize. Cloudwith.me describes the issue that exists in the current market related to cloud services. On a centralized service that exists, you have the ability to store your data or run your application, but as it is centralized you are at risk. The fact that one provider “controls” the data, you are subject to the security measures of the provider. If the provider is hacked, or simply loses power to one of its server centers, data could be lost or compromised. These can be rectified but can take time and leave you without access to your data. By creating a decentralized cloud service solution Cloudwith.me addresses the risks associated with the centralized system. With the information spread across hundreds to thousands of nodes and redundancy of the information across those nodes, the data or application is much more secure and stable. If one node is compromised or loses power, there are more nodes that contain that data and you will have no downtime. Regarding the ability to maximize application processing on the blockchain, we have seen an example of this with Golem. Golem is a project with the objective of becoming a “super computer” allowing users to garner the available bandwidth from its decentralized network of providers that have the capacity to process on their existing infrastructure that they do not use. When it comes to cloud storage we have seen various project launched on the blockchain including Storj. This solution allows users who need to store their information on the cloud to do so through Storj’s network of decentralized “farmers” who have extra storage on their existing infrastructure. This provides redundancy and security of the data. The true value of the Cloudwith.me platform is that it provides both of these abilities in one place. Users that need both cloud hosting and the ability to process their application through decentralized blockchain technology can do both on the Cloudwith.me platform. The second benefit for the users is that Cloudwith.me has already a working platform that has this ability and has proven to be effective. Taking the platform on the blockchain will reduce costs tremendously which obviously brings great value to the user. The basic building block of the decentralized cloud platform is a GridNode component, providing the basic cloud platform service blocks. The GridNodes are interconnected to form a mesh network for service management and request routing. Each GridNode is connected to the blockchain. The GridNodes expose a uniform application runtime environment, thereby allowing seamless migration of application code between service providers. The application owner creates a blockchain-based accounting relationship with the decentralized platform, not with the providers. GridNodes are intended to be installed and operated by GridNode owners, who can be independent operators as well as cloud service providers. This flexibility allows the grid to evolve from the current state and expand to a global scale. This is, of course, a long term vision that is extremely flexible and supports a wide variety of use cases. But as explained in later sections of this document, the evolution of GridNodes can start today by supporting a limited set of scenarios and gradually evolving to fulfill the open grid vision. Step 2: Adoption by millions of providers that have their own extra capacity for storage and computing power across the world. This adoption will allow for complete decentralized cloud services and the most secure and efficient platform. Cloudwith.me has done an analysis of the amount of power that the gridnodes would have to possess in order to compete with the large players in the market at this time (details of the computation are in the whitepaper). Based on this computation, there would need to roll out 10,240 Gridnodes. This calculation will help you to understand the Crowdsale goal of 300 million dollars. 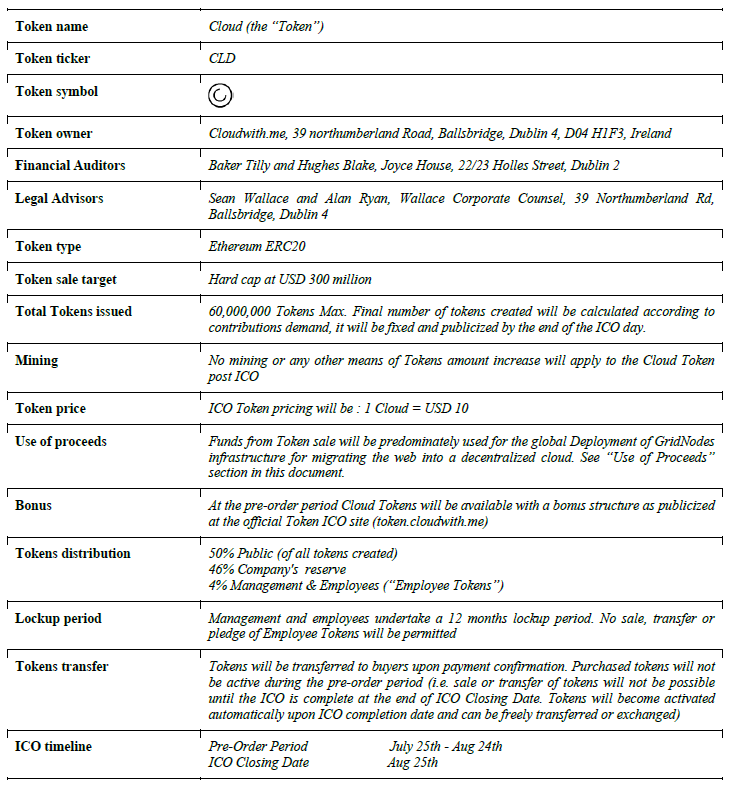 “The Etherium based Cloud token ICO is intended to create the first block in the vision of Decentralized Applications internet by providing a standard currency to be used by all cloud services and service providers.